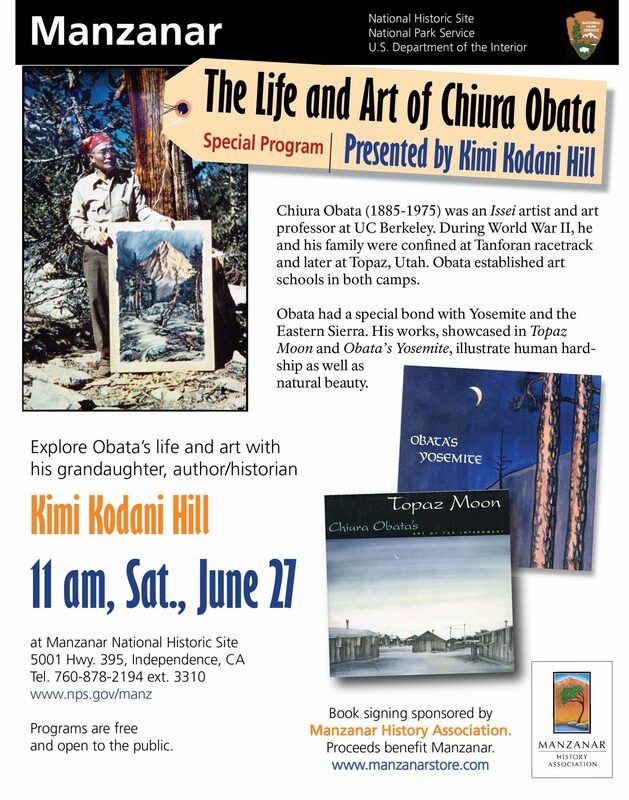 All are invited to the Manzanar National Historic Site at 11 am, Saturday, June 27, for a special program “The Life and Art of Chiura Obata” presented by Obata’s granddaughter, author/historian Kimi Kodani Hill. Chiura Obata (1885-1975) was an Issei artist and art professor at UC Berkeley. During World War II, he and his family were confined at Tanforan racetrack and later at Topaz, Utah. Obata established art schools in both camps. Obata had a special bond with Yosemite and the Eastern Sierra. His works, showcased in Topaz Moon and Obata’s Yosemite, illustrate human hardship as well as natural beauty. The program is free and open to the public. After the program, Kimi Kodani Hill will sign books in the Manzanar History Association bookstore (www.manzanarstore.com). Proceeds benefit Manzanar. I am pleased to present the 2014 Inyo and Mono Counties’ Annual Crop and Livestock Report. This report is prepared pursuant to California Food and Agriculture Code 2279, and is a statistical compilation of agriculture production in Inyo and Mono Counties. These values reflect gross agricultural production within the two counties, and do not represent net profit or loss. The gross combined agricultural production values for Inyo and Mono Counties in 2014 totaled $58,606,000, representing a decrease of nearly 21% from 2013 production values. Drought conditions continue to significantly impact area agricultural businesses, and are the reason for the majority of decrease in value over last year. Livestock herd reductions began in 2011 with the drought and have continued each year thereafter. Herd sizes are now so small that rising beef prices no longer mask production losses when viewed in terms of dollars. Feeder cattle gain is also in sharp decline due to unavailability of pasture. Field crops continue to suffer as water supply diminishes. This year does not look to be the end of this downward trend as we enter another year with even lower runoff projections. This report features both wool production as well as fruit and nut statistics for the first time for Inyo and Mono Counties. Additionally, Inyo county is now reporting nursery stock production. Statement from Inyo County District Attorney Tom Hardy. At a sentencing hearing on Thursday, June 18, 2015 local businessman Jose “Jay” Jiminez was placed on five years of formal felony probation and ordered to serve 240 days in the Inyo County Jail for embezzling from a now-deceased client who had given him a power of attorney. He must serve an actual 90 days, and may apply for electronic monitoring for the balance of his sentence. The court set restitution in the amount of $79,449.76. He is also forbidden from acting as a fiduciary and from managing money or property on behalf of other individuals during the term of his probation, and may not engage in the tax preparation business. The case began in August, 2012, when the Ombudsman’s Office received a complaint on behalf of the victim and a criminal investigation was initiated by the Bishop Police Department. The investigation discovered that in November, 2011 Jiminez was granted power of attorney by the victim in the case. This gave Jimenez access to the victim’s bank and credit card accounts. Jimenez used the power of attorney to pay bills for victim; but he also used the accounts to fund his businesses, Jimenez Tax Service and Petite Pantry, as well as pay personal bills. In March, 2012, Jimenez also sold victim’s mobile home for forty thousand dollars ($40,000.00). Jimenez received seventeen thousand dollars cash ($17,000.00) and a 2004 Hummer valued at approximately twenty-three thousand dollars ($23,000.00). Jimenez apparently pocketed the cash – records indicate it was not deposited into any account owned by the victim – and took possession of the Hummer. Mr. Jiminez had previously entered a “no contest” plea to a felony embezzlement charge. The next meeting for the Inyo County Board of Supervisors is set for July 7th. Cover photo by Arnie Palu, left to right, Alden Nash (area 1 board member), David Hefner (area 2 board member), LeeAnn Rasmuson (area 3 board member), Mary Kemp (area 4 board member), Ted Pederson (friends of the mt whitney fish hatchery), Illissa Twomey (Inyo County Office of Education), Chris Langley (area 5 board member). photo taken at the Community Star Awards held May 19th. The June 4th Inyo/LA standing committee meeting was dominated by a shared sense of cooperation between Inyo County and the Los Angeles Department of Water and Power. Working through another year of drought the two parties agreed to reduce water to the McNalley enhancement/mitigation project and Warren Lake while securing irrigation water through July. The next Inyo/LA standing committee meeting is set for July 24th in Los Angeles. The body that was located off the Shepherd Pass trail has been identified as 37-year old man, Kenneth Pledger, from Colorado City, AZ. According to the Inyo County Sheriffs Department, at this time the cause of death has not been determined. Back on Monday, May 18th, 2015 Inyo County Sheriff’s Dispatch received notification of a deceased person off the Shepherd Pass trail at about the 12,000′ elevation level. The information shared with the Sheriff’s Office from the reporting party was that it was evident that the person had been deceased for some time. Due to the demanding and steep terrain, it was determined that a helicopter recovery would be the safest mechanism to remove the body. Several attempts were made, but due to the recent storm activity in the High Sierra’s the recovery mission had to be held off until the morning of Wednesday May 27th. CHP Helicopter H-80 out of Apple Valley was utilized. Inyo SAR members were able to safely secure the remains for transport to the Lone Pine Airport where they were met by the Inyo County Coroner’s Office. The mood was light and casual Thursday as the Inyo/Los Angeles Standing committee discussed serious business. The meeting was scheduled to begin at 11am in the Independence board of supervisors chambers, but the pledge of allegiance did not start the session until 11:22. After the delayed start there was little tension in the meeting, as Inyo and LA representatives agreed on all fronts. The session opened with the two parties agreeing to a reduction in water supplied to the McNalley ponds and pasture enhancement/mitigation project. Inyo Water Department Director Bob Harrington noted that the potential pumping wells that could supply the project are in “off” status, and Owens River diversions are not a viable option. LADWP Aqueduct Manager Jim Yannotta presented the grim numbers associated with runoff and operations. Yannotta relayed the fact that the anticipated runoff for the first 6 months of the water year are at 25% of normal, and just 36% for the entire year. Yannotta notes this is less than half the flow of the worst year on record. The operations and runoff update led into the big item before the standing committee, that being irrigation. Back on On April 27th the LADWP had written ranchers notifying them that all irrigation would end on May 1st, that order was later lifted. At the time the LADWP’s spokesperson Amanda Parsons said, “Collaboration with local partners” will allow the LADWP flexibility with how they distribute water for in-valley uses. Thursday LA indicated they are able to continue irrigtion to local leases due to approximately 2 thousand acre feet in savings at Owens Lake and by adding 3 thousand acre feet from pumping. Yannotta indicates the pumping plan is “conservative, and will not affect vegetation or groundwater levels.” Yannotta also noted there is an additional 3 thousand acre feet stored in Crowley Lake that will be released for irrigation. Overall, a clear feel of cooperation dominated the day, as light rain fell in Independence. “I think the tone of the meting was really positive, obviously we have tough issues we are trying to work though with the city. One thing that I think is important to recognize is that we are all working sort of on one common goal, and that is to figure out the best way to use the water that we have to the best advantage of everyone here in the Owens Valley.” Said Kingsley. The next standing committee meeting is set for July 24th, in Los Angeles. The Inyo County/Los Angeles Standing Committee meets Thursday, June 4th in the Board of Supervisors Room, Independence. Thursday’s agenda includes a runoff and operations update looking at “Water availability for Owens Valley and Los Angeles”. There are two action items before the Standing Committee, the first looking to approve a program for reasonable reductions in irrigation water supply for Los Angeles owned lands in the Owens Valley, for recreation and wildlife projects, for projects implemented as part of the Inyo/Los Angeles Long Term Water Agreement, projects associated with the 1997 memorandum of Understanding, and for enhancement/mitigation projects. The second action item is asking the Standing Committee to consider the approval of reductions in water supplied to the McNally Ponds and Pasture Enhancement/Mitigation Project. Time will also be set aside for public comments. The Thursday Inyo/Los Angeles standing committee meeting will begin at 11am in the Board of Supervisors Room, County administrative center, 224 North Edwards Street, Independence. Two solar workshops are being held this week. Inyo County is conducting the public workshops to provide and gather information on the Owens Valley Study Area (OVSA) and solar energy development. The public workshops will provide information on the OVSA, and information collected to date will be on display. The workshops will also provide the opportunity for participants to ask questions and provide comments and information about the Owens Valley Study area. Tuesday, June 2nd. 6-8pm, City of Bishop, City Council Chambers, 377 west line st.
Wednesday, June 3rd. 6-8pm, Statham Hall, Lone Pine, 138 North Jackson Street.